It had been raining heavily all morning, but we were determined to get to Carson’s regardless of the weather. By the time we arrived, the sun was starting to shine so the patio felt like the perfect spot to enjoy our lunch. After we were promptly seated, our server, George, stopped by to get our drink orders, and we immediately began to pick his brain on what to order. We already knew what appetizer we would choose…. 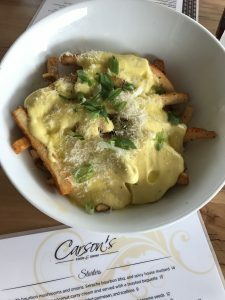 Béarnaise Truffle Fries! George also mentioned the SO-CAL Cheese Burger and the Grilled Ham & Gruyere sandwich. Our mouths began to water and we said, YES to both of those. We threw in the Caprese Salad as well, because who doesn’t love fresh mozzarella and basil?!?! The outdoor area was nice. It was a little loud at first with the cars driving by, but being right in the middle of downtown Lexington was great! 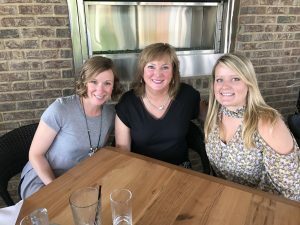 It felt like we were out of town experiencing the hustle and bustle of a new city and a cool, new lunch spot for the first time. We were quickly reminded of our Lexington roots, when ice-cold water appeared in a repurposed Woodford Reserve Bottle. Our Béarnaise Truffle Fries were delivered promptly and our eyes about popped out of our heads. My goodness! 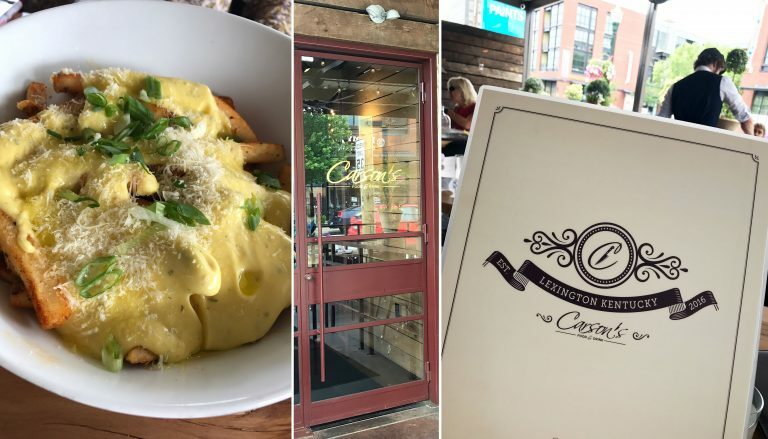 It was a very GENEROUS plate of perfectly cooked truffle fries SMOTHERED in Béarnaise sauce. And for a bowl of fries, the presentation was incredible. Looked almost too good to eat. Well, not really. 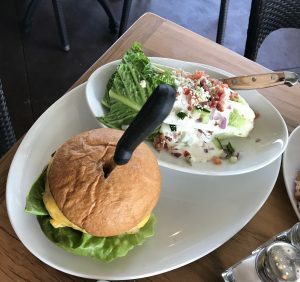 We only thought that for about 2 seconds, snapped a pic, then the forks were flying! It was the perfect appetizer, but we held back knowing the sandwiches and salad would be in front of us soon. By the time the rest of the food arrived, we were teetering on the edge of (dare I say it), being FULL. We pulled it together and buckled down for the last round of our lunch. Again, the presentation was spot on. Even the plated cheeseburger looked phenomenal and almost too good to eat. The burger was tender and perfectly cooked on top of a fresh bun with just the right amount of thousand island dressing. Since we already had our fill of truffle fries, we chose to pair the burger with a Romaine Wedge Salad that could have been a meal itself. The grilled ham and gruyere sandwich was incredible and could have easily fed two people. 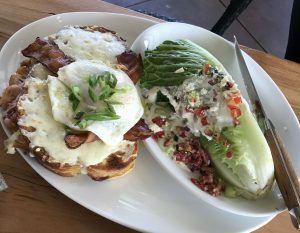 It was huge–piled high with ham and gruyere cheese, topped with Cherrywood bacon and an over easy egg. Yes, this is real life. That sandwich does exist and it blew our minds. The Caprese Salad was one of the best we’ve had. 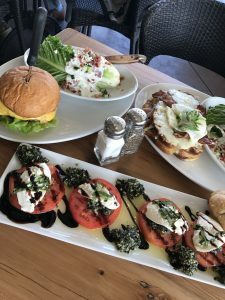 Fresh, seasonal tomatoes topped with a generous medallion of cheese, fresh basil, a balsamic reduction, olive oil, and to top it all off… fresh pesto. It was light, but filling at the same time. The buttery roll that accompanied the salad was a perfect addition and was used to soak up the last bit of balsamic reduction and olive oil. As we finished our last few bites, George came by to check on us. We appeared full and groggy. He asked if we had room for dessert, but we knew dessert was NOT an option. Instead we opted for a couple of to-go boxes to share leftovers with our loved ones, or for an afternoon snack for ourselves. Overall, the experience at Carson’s was great. 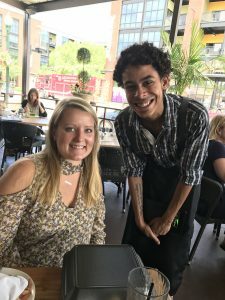 Our server, George, was attentive and friendly. Even the manager, Matt, stopped by to check on us frequently, but not intrusively, to make sure we had everything we needed. The service was prompt, but we never felt rushed. The owner, Mark Fichtner, stopped by to thank us for coming and to make sure we enjoyed our meal. Go hungry and you will certainly leave full and happy. Open Every Day at 11:30 a.m.